Image: "Michael Brigg sailing his 50 year old veteran (K102) alongside Peter Ullmans state of the art Maas design canoe (GER79) at the 2017 Worlds, Pwlhelli. Photo: © Robert Muller"
Image: "Scarlett O'Hara at the 2011 worlds, Travemunde, Germany. Photo: © Robert Muller"
Image: "A smile for the camera? Between races at the 2013 Europa Cup.. Photo: © Loch Lomond SC"
The 2006 Europa Cup was held as part of the 117th Travemunde Week in Germany over four days at the end of July during a heat wave with daytime temperatures over 30 degrees Centigrade and the water at 23 degrees, giving majestic conditions. 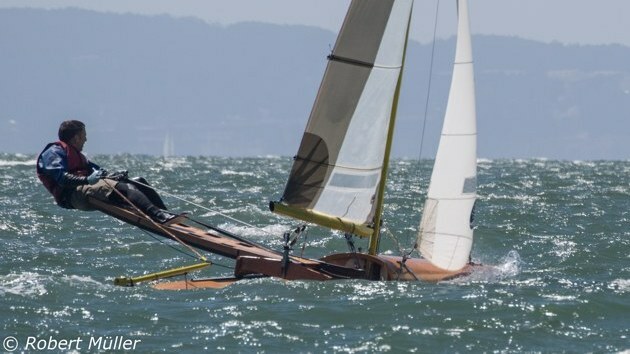 On some days racing was delayed to give time for the sea breeze to set in which then gave spectacular conditions for the sailing in an ideal range of wind speeds to suit all preferences, typically a force 3 building to a force 5 as the day progressed, kicking up some significant waves. The racing was well run by race officer Birgit Hartmann and the host nation's hospitality was much appreciated, leading to the proposal that the next but one World Championships should be held at this same venue. 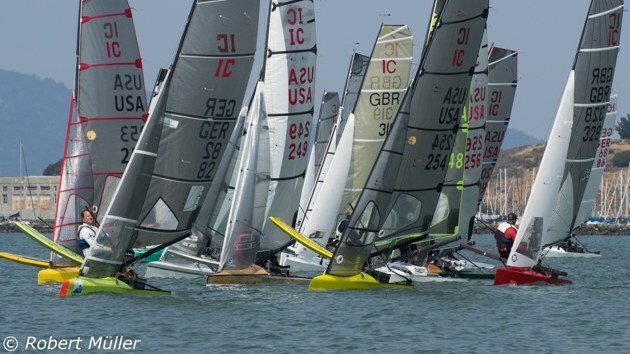 Twenty six competitors from four nations attended the event, split into the largely British AC fleet and the larger standard IC fleet consisting of almost all known canoe sailors from the host nation and several from the rest of Europe, including the only British IC sailor, Colin Newman. 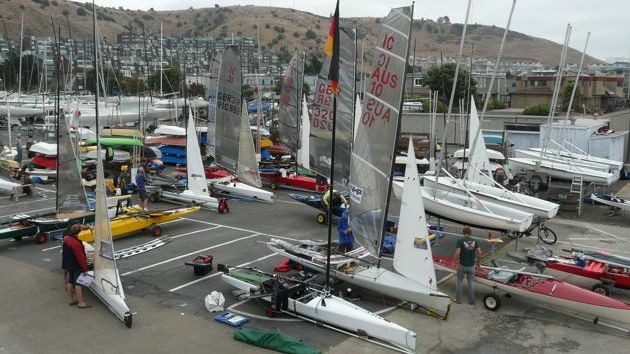 The IC and AC classes started together but after the windward mark the ICs sailed a triangle/sausage course and the ACs sailed a windward/leeward course. 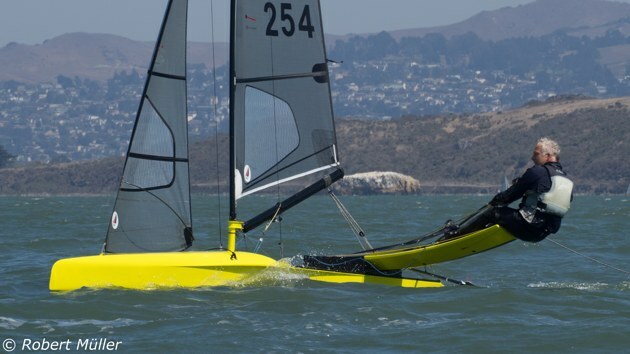 In the ICs Colin Newman won the closely fought 12 race series by three points from Peter Ullmann (Germany), with German twenty year old Manuel Radek third, and best of the juniors from Sweden and Germany. The series produced six different race winners including one for the current German National Champion, Anette Steinmann. After being tied on points for first place with Manuel at the end of day three, a second followed by a first on the final day gave Colin the Championship with a race to spare. 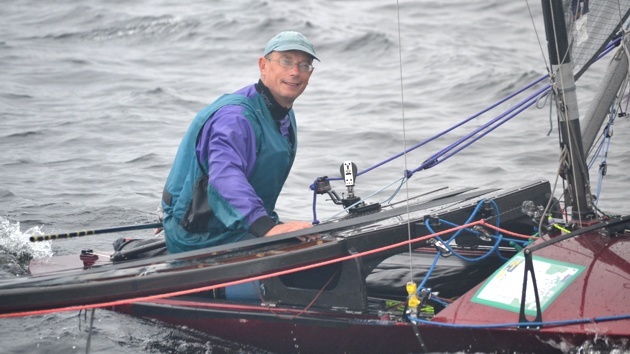 By winning in the ICs he became the oldest man in the history of the class to win the Europa Cup, leading to speculation that he may also be the oldest man in any international, single-handed dinghy class to win a European Championships. 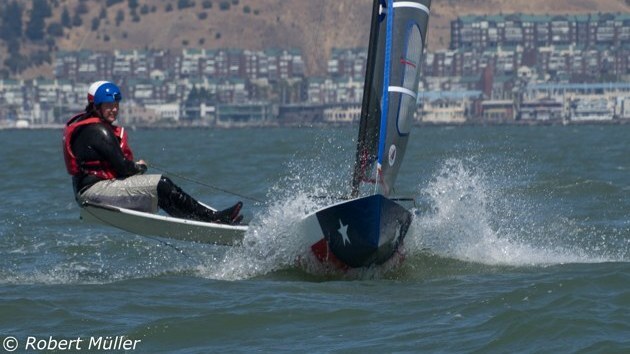 It was his first ever championship win in any national or international event in any boat. Racing in the ACs was every bit as close with nearly all the competitors getting a top three place at least once in the series. After a second in Race 1, followed by two lost races with gear failure and an OCS in Race 4, Robin Wood needed eight straight wins in the remaining eight races to secure the AC title, a feat he achieved to squeeze out fellow Welshman, Steve Bowen into second place. 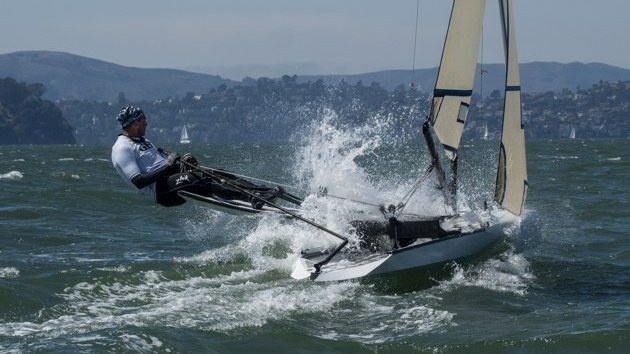 Colin Brown finished third one point ahead of Phil Allen with the best German AC sailor, Tobias Kunz fifth in a truly memorable championships in which all ages and weights of competitors competed on equal terms in a diverse range of designs of craft. The results available to me do not distinguish between DNF, DNC, OCS and DNS. All are shown DN. 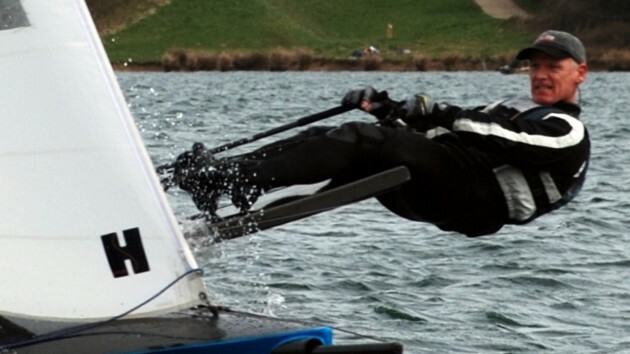 Image: "Blue Horizon Behind Blue Horizon John Ellis (GBR318) at the 2011 worlds, Travemunde, Germany. 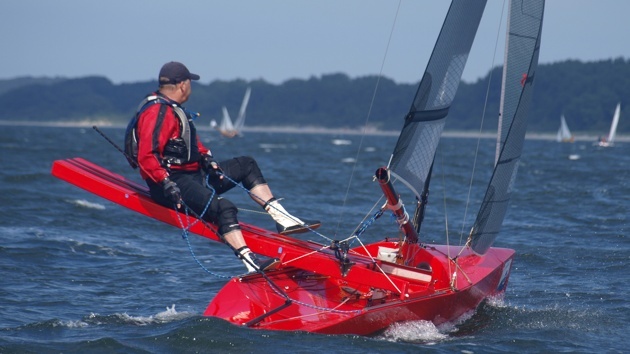 Photo: © Robert Muller"
Image: "Mark Rounding In Lighter Conditions: Peter Ullmann (GER79) and Chris Maas (USA246) at the 2011 worlds, Travemunde, Germany. Photo: © Robert Muller"
Image: "Charlie Chandler (GBR321) at the 2017 Worlds, Pwlhelli. 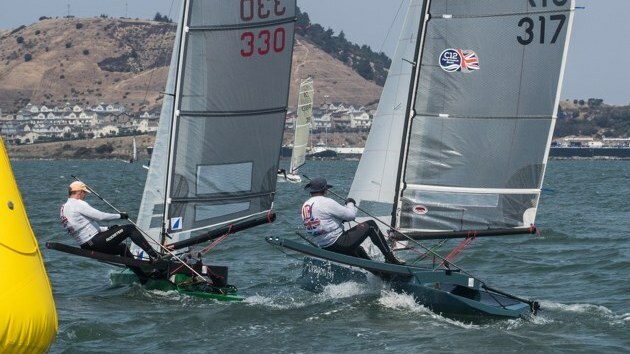 Photo: © Robert Muller"
Image: "John Ellis (GBR334) at the 2017 Worlds, Pwlhelli. Photo: © Robert Muller"